After making the move a hit-based format for 2014-15, 2015-16 SP Game Used Hockey continues the formula with five premium cards per box. While that does not mean that all options are exclusively autograph or memorabilia cards, the few other versions are quite rare. The term base card is a little misleading in SP Game Used, but there are 100 such cards in the release. The thing that makes them different than most is that each card, veteran or rookie, is numbered to the player's jersey number. On top of that, the actual jersey number is an Auto Variation. So Wayne Gretzky's base card would be numbered to 99 copies and card #99/99 would be signed. From there, SP Game Used is a mix of autographs and memorabilia cards. Starting with the signed options, Draft Day Marks are limited to 35 copies per letter for rookies and ten copies for veterans. Likewise, Inked Sweaters are found for both rookies (#/149) and veterans (#/99 or less) along with Patch (#/49 or less) parallels. 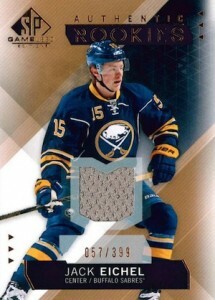 Base Jersey parallels are among the most common memorabilia cards in 2015-16 SP Game Used Hockey and average 1:1.75 packs, while Base Patches are numbered to 99. Carrying over to the rookie class, Authentic Rookie Jersey (#/399) and Patch parallels (#/99) build on that. 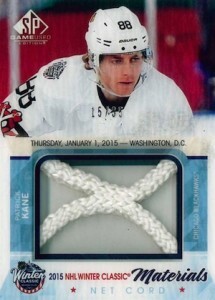 Continuing with the relics, Net Cords are an inner case hit and feature game-used net pieces from the 2014 or 2015 Stadium Series, Winter Classic or Stanley Cup games. In addition to the primary version, numbered to 35 or less, there are also Red Light parallels, limited to five copies, and one-of-one Shield Logo parallels. 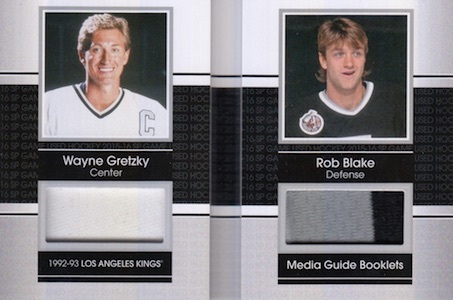 Media Guide Booklets Jersey (#/65) are a new addition and include jersey relics for two players. There are also Patch (#/15) and Tag (#/3) parallels. Game Gear relics are found from the 2015 All-Star Skills events, 2015 Stadium Series game or NHL Legends. Each version is numbered to just three copies and includes four different relic pieces (jersey, patch, tag and fight strap). 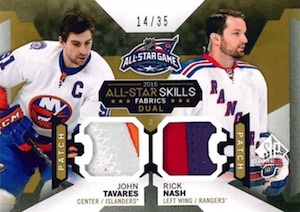 2015 All-Star Skills Fabrics are found in Jersey (1:1.5), Dual (1:3), Triple (1:5), Quad (1:8) and Sixes (#/10) versions. There are also Patch parallels, numbered to 35 or less. More All-Star Skills options are available in the form of All-Star Skills Relics Jersey (#/125), Jersey Parallel (#/49) and Patch Parallel (#/25). 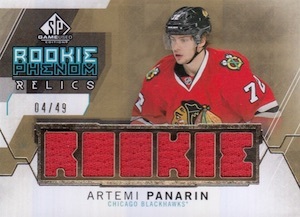 The rookie class is again featured in 2015-16 SP Game Used Hockey with 2015 Rookie Phenoms Relics Jersey (#/125), Jersey Parallel (#/49) and Patch Parallel (#/25). Each dropping 1:710 packs/boxes, 2015 Stadium Series, 2015 Winter Classic and 2015 Stanley Cup Finals Game Used Pucks include a piece of game-puck from some notable games. Finally, the premium relic options conclude with Supreme Patches (#/15) and Supreme Sticks, Gloves, and Skates (#/15). 200 cards. Actual jersey number card is signed. i.e. Wayne Gretzky's base card is numbered to 99 copies and card #99/99 is signed. Note: Not all subjects are included in each parallel. View the full spreadsheet for specifics. 115 cards. Specific group odds noted below. 125 cards. Specific group odds noted below. Overall odds - Copper Veteran Jersey 1:2 packs. 40 cards. Specific group odds noted below. Note: Not all subjects are featured in each parallel. View the full spreadsheet for specifics. I will not rate the product yet, but from what I can see, I’m really not impressed. The design and especially the colours look faded and without any appeal. And again, same old stickers. 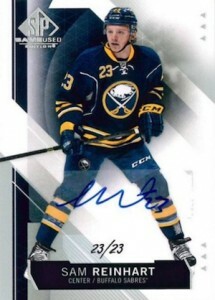 Couldn’t they release hard signed cards at least for the base set, where there’s ONLY ONE signed card per player? This is a High-End product. I’m not one of the people who would rate a product accordingly to my specific pulls, because that’s highly subjective, but I’m still expecting some quality for the product I’m paying for. Also, I’ve noticed so many All Star related cards. In general, buyers don’t care much about these. And besides, why put pictures of the players in their team uniform, if the cards belong to an All Star set?? Moreover, I’m not a big fan of collections with a huge numbers of sets. Sure, I like diversity, but there are 45 sets in this collection. 45??!! That’s way, way too many for my taste. At the same time, I have to admit that some of the sets are simply parallels to the main one, but still. I also have a problem with the checklist. In a High-End product there shouldn’t be a 100 rookies checklist. That’s again, way too much. There are names there that should be found only in OPC, MVP or other Low-End collections. Don’t get me wrong, I like to see names that will probably not make it to the NHL, but not in a High-End product. All in all, I have the impression they produced again more boxes than usual just to milk the McDavid cow. BUT, this is only the impression I have from a quick lecture of the checklist. Perhaps after breaking the cases I purchased and reading other opinions I will see things differently. Time will tell. I totally agree with tc boutique, I can just imagine the disappointment after spending 160 on a box, this should be called sp all star game used, too bad you couldn’t include john scott. what a joke, wont be opening any of this, getting a mcdavid is a huge longshot that wont really pay off because you either get his sticker auto or a manufactured letter, im starting to really get turned off with upper deck, just buy the mcdavid card itself its the same cost as two boxes rather than ending up with Andrew copp or some other opc stiff…. 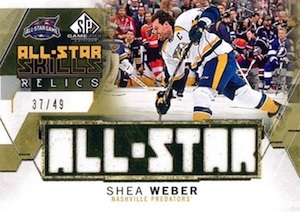 who cares about the nhl all star game anyway after this year with no Crosby,ovechkin,toews, id honestly rather have an all star card of yzerman etc from 1990 pro set than a rick nash all star jersey or sock the size of a nickel�.. This product was revamped to give rookies some value the past few years. The problem is the rest of the product has zero value. All-Star game stuff is nice, but should not be the majority of hits. UD is making a fortune this year by removing content with McDavid to lean on. This won’t work next year, really doesn’t this year but people will take the beating because of Connor. UD has lost all sense of creativity and product construction. This is the first time I rate a product 1 star. Worst hockey collection I’ve ever opened in my life. It doesn’t even worth to make a detailed evaluation like I usually do. All stars, all stars, all stars, all over again. I mean, really? Only jersey without any value what so ever, the most famous completely-white-“patch” all over the place, no creativity, many, many no names for a price it is out of this world! When there are tons of players I’ve never heard of and never will in a HIGH-END product, something is dead wrong. Like the 1 star suggests, AVOID this product like plague! The case the I had pre-ordered came in today and I just finished breaking it. I must say I am truly disappointed. I’m 100% in agreement with others here. 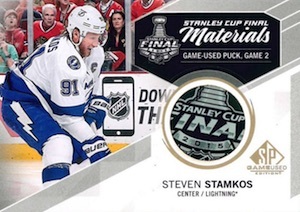 Of the 100 cards in my case, 39 of them were All Star Game or Stadium Series content and 1 was a Stanley Cup Final Net Cord – that’s 40%. As far as RC’s go; 8 AUTO’s, 8 Jersey’s, 3 Base Cards, 2 Patches, and 4 Phenom Relics. that’s 25 cards, so 25% of the case was rookie-related. Of those 25, 1 Eichel (Jersey), 2 Panarian (Base Card & Phenom Relic), and 3 Larkin (Jersey, Patch, and Phenom Relic). Of the remaining 35 cards, a Media Guide #’d to 15 and a Draft Day Marks #’d to 10 – everything else was #’d 35 and higher. Perhaps it was just my turn to get a case that wasn’t a good return on my investment, but after all the hype of this product I guess I expected more than almost half of the case being $8 – $12 cards. That would be very nice if the All Star cards would sell for 12$, but I highly doubt that. They’ll end up selling for 3$-4$ CAD (if). I spent the last couple of hours watching (and in one case joining) breaks for this product and I’m actually appalled at the return on price that’s included in this. 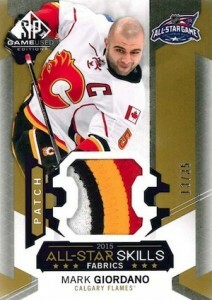 Basically they should just rename the product “SP All star game crap and a few other cards”. Those all-star game cards are like dead-cards and there are sooooooooooooo many of them. This set is just plain ugly, my least favourite of all this season’s releases. Just getting back into collecting (maybe) and keep seeing negative reviews like the ones written here. I left it behind in the early 90s because over saturation made it pointless and obviously a bubble. Have to wonder if the same thing is happening again. Now they don’t over produce the same cards, the over produce “unique” cards and sets, which is pretty much the same thing isn’t it. Poor showing for what used to be an excellent product. Material swatches are micro-sized. Autographs are few and far between. The one pack “Vegas Box” style ruined the SP brand which used to offer the nicest base cards in the hobby. Limited number of rookie cards is disappointing. Rookie jersey letters are manufactured….this practice has to stop. Signing on fabric bleeds the ink and looks horrible IMHO. I bought 2 boxes just to see what the hype was about, even though I read a few negative reviews. I do not collect to make a profit. I looked at prototypes on here and other sites for the past month so I already new I didn’t love the look of these but didn’t think they were horrible either. The cards aren’t bad, but I agree there are too many All-star cards. I am a bit biased because I don’t really care about the All-star game, especially the last couple of years. I got 3 All-Star Skills, one was a quad. I agree that they lack eye appeal. I did get two auto’s both from the Islanders, two base jerseys, a Max McCormick rookie 40/89, NHL stadium series relic Logan Couture 03/25 and a media booklet of Nugent-Hopkins and Eberle 1/3. Not bad for two boxes. I have been enjoying the Black Diamond series even though it’s double the price. I would rather pay that to be honest. I like the design and quality. The base cards are nicer than some of the cards I recieved in the SP. The series has only been out for a day, I am sure there are plenty of good cards to be found. This is a good collection for people who do not care about a high value return. I would consider these a mid-end value memorabilia set. My $8-$12 comment was where I expect Beckett to value the cards – you $3-$4 range is probably what I’ll end up getting for them when I list them for sale. I only opened 2 boxes, I was pleased by pulling a Larkin/71, so I have no complaints. I have seen some pretty bad case breaks where the was little value to be expected in any return. Decent cards but yes pricing is inflated by distributers/wholesalers and sport card shops, but they are in it for the money. 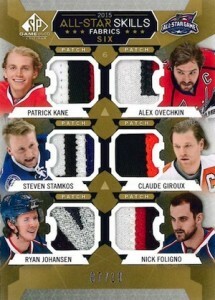 As with every product thers always some teams will have more hits then other teams in an inner case or full case. Always best to check product checklist to see what team what players and how many cards they have in the product. On this product you are better off buying a team such as Montreal-LA Kings-Chicago- they seem to have more card players in the set they all the rest of the teams. 1 question I have though cause cant finf the correct answer is if base cards are all numbered as upper deck says and the card that has a players jersey number example Crosby wears 87 so if one gets base card 87/87 that card should be with an Autograph should it not. I say this I came across in a case break Team Nashville Anthony Bitetto wears jersey number 2 well the card was 2/2 and it is NOT SINGED!!! Only the veterans are signed not the rookies. So you won’t find a Mcdavid auto even though you pull his 97/97. I doubt that. There’s Hellebuyck 37/37, signed, 1 of 1, on bids on eBay. Thanks TC I saw the break with the Bitetto and it was not signed. Maybe they goofed and forgot to put the sticker on the card. UPPER DECK IS BRUTAL NO WONDER WHY THEY LOST MLB, NFL, NBA LICENSES, SO OBVIOUS THEY ARE RIPPING OFF HOCKEY COLLECTORS, ABSOLUTE CRAP, SOMEONE NEEDS TO TAKE A STAND AGAINST THE QUALITY CONTROL…. So many damaged cards in this product it is ridiculous. I’m a fairly new collector. Bought 3 boxes and I wasn’t upset. I received NO ALLSTAR cards. I received two stadium series net cards and a Stanley Cup Puck Card as the major hits. The rest of the cards were OK.
After buying team buys in random breaks its worth the money ONLY in Team BUYS Breaks. Here is a pointer what I mean by Take NYI cost $25 per case break and you end up with 4 cards on average and chance to win the randoms double-triples-4quads and 6 quad cards are they are many of those that show up in cases. The other best team LA KINGS for $70 in a case break it has excellent potential hits and I have recently hit large TAG 3/3 GRETZKY/BLAKE. The worst team buy Edmonton at 330.00 will just empty your pocket as to get a DRAFT DAY MCDAVID is next to impossible. More then half of these cards are or have been sold on ebay. Team buys are the way to go and do your research on what teams have the most cards per set. I was in a random break. Got Jets and they pulled 19/19 Signed auto for Nicolas Petan. It’s a 1/1 because they only sign the jersey number card. The card came in a plastic sleeve inside the pack. I was very pleased. Jeff � Congrats on the nice pull Jeff! 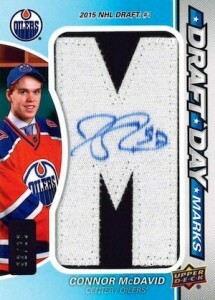 Spent $25 in a Team Random and got my self the Connor McDavid signed numbered card. Can someone tell me how rare and valuable this card is? Got in on half a case break team random. Bought 1 entry and landed Edmonton. Last box (pack) yielded a McDavid DDM /35 and it was the only major hit in that half case for anyone. It was loaded with single coloured jersey swatches, a couple nice patches and one base card (/61 I think). This product is for those who like a good gamble but I highly recommend joining a break. It cost less, so you don’t feel as bad if you don’t hit anything. Can’t find Blue Auto #210 Adam Pelech in the checklist which I have in my collection. Was that released in 16-17 or why is it missing? Thanks. ?????????? I haven’t hit one in four years ….